Welcome, Blog Hoppers! 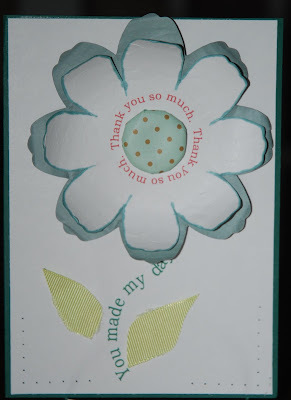 The CardMonkey is proud to participate in Crafty Card Gallery's New Year's Thank You Cards blog hop. During this long weekend (ahhhhhh! ), I will try to post as many thank you cards as I can make while hopping along with you. Check back as often as you'd like, as I'll add more cards/ideas. And don't forget to read on, as there will be several opportunities for blog candy added every day! Who doesn't love candy!? Day 1, Card 1: "You made my day" flower, shown at top: For this card, I first computer-generated the circle-centered text "Thank you so much", and printed the sentiment on white cardstock. At the same time (and lower on the paper), I also printed the curved sentiment "You made my day." Both of the sentiments are easy to set in curves or circles using the Adobe Illustrator software. I then cut a large white flower using the centerpoint feature on my favorite Cricut Cartridge, "Cake Basics". I inked the edges of the flower in a pretty blue-gray ink in my stash. Silly sidenote: I got the "Cake Basics" cartridge in my Cricut Cake bundle in August. To be honest, I haven't yet used the pretty red Cricut Cake at all -- I don't have the time! -- but I use the cartridge alllllll the time. Good, basic shapes! Do you have Cricut Cake and have you tried it for anything other than cake decorating? Please let me know! I cut a second flower in the accent color (blue-gray), bumping up the size by 1/4" to work as a shadow. I rubbed each flower with a stylus, on a foam pad, to soften the cardstock -- then curled the petals using a reverse tweezer. The flower leaves are fussy-cut from ribbon. 1. Post a comment to this post. Indicate that you'd like to win Candy #1, and provide me with some e-mail way of contacting you when your name is randomly selected. For an extra chance to win Candy #1, become a follower here, OR let me know you already are a follower. 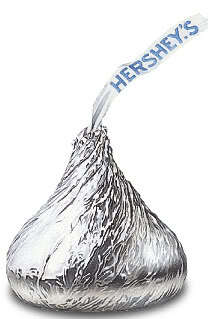 Scroll down and look for the KISS for MORE CANDY to win! It's the Grand 2010 CardMonkey giveaway!! Update -- 10:30 a.m. - 12/31/10 -- Already, another card!! 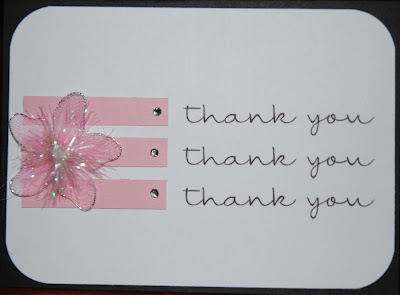 Day 1, Card #2: This is a rather simple but elegant thank you card. On white cardstock, I created and repeated the sentiment using a computer-generated font and printer. Then, using some pink paper scraps cut to the same length/width, I highlighted the sentiments. Adorned each strip with a small rhinestone and for extra zing, affixed a cute Creative Charms flower. I rounded the corners and glued the whole piece onto a pre-made black card with a white interior. Yup ... it took about 10 minutes, tops. Simple and sweet! More Blog Candy! For a comment mentioning Blog Candy #2, you can win a chance to receive an embellishment grab-bag. Guaranteed it will have some brads, stickers, rhinestones and pearls ... a little of this, a little of that. If you've already commented looking to win Blog Candy #1, go ahead and post again for Blog Candy #2 ... let me know what you think of Card #2 and that you'd also like to earn a chance at this Candy! And yes, MENTION that you're a follower -- or become a new one -- for an additional chance to win the candy! And ladies (and any gent followers) ... Here's the big news! For each card/candy you comment upon, you'll receive one entry into the CardMonkey Cricut Cozy giveaway at the end of the Blog Hop!! That's right -- a custom-made cozy cover just for you. There's not much time left before the ball drops in Times Square, signaling the end of 2010 and the start of what I hope will be a fabulous year. It's 11:45 p.m. here on the East Coast, and I'm just getting around to making and posting another card for the Spectacular New Year's Thank You Cards Blog Hop. For Card #3, I cut a frame from a shimmer lavendar paper. Quite honestly, this cut was in my scrap box that I came across while cleaning my Craft Loft -- I think it was an off-cut, where I used the inside for something else along the way. On white cardstock, I printed the sentiment using a computer-generated free font (how pretty!). To the side of the frame, I added a rose, a daisy and an amaranth. What's an amaranth, you ask? "An imaginary flower said never to fade." In other words, one I conjured up just because. The flowers were made using Punch A Bunch paper punches. I colored the rose's petals using Copic markers and a blending marker; the yellow in the daisy is Flower Soft. Did you know that Flower Soft is made from ground-up PVC pipes?? There ya go! Feeling the card still needed a little "more", I colored some pearls (using Copics) green and fixed them to the points of the frame. I think it's a pretty card, do you? Candy #3 -- Here it is, I'm offering up some handmade flowers ... some like these, and some other kinds I've made too. There will be at least a dozen, maybe more ... definitely worth your while! To win, post a comment about Card #3, and indicate you'd like to be entered in the drawing for Blog Candy #3. Don't worry if you've already entered for Blog Candy #1 or #2, you're still eligible for this Candy too. And you'll get an automatic entry into the Grand Prize (Cozy Cover, below). If you become a follower or are already a follower, please say so in your comment for an extra entry! Whooo-eeee, don't worry, I'm keeping a spreadsheet for your entries!! Are we having fun yet!? I am! Here's the news about the GRAND PRIZE, celebrating the end of 2010 and beginning of 2011! Not a card, but a THANK YOU! 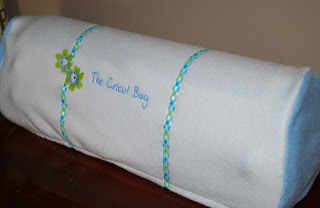 Here it is, the infamous Custom Cricut Cozy that will be made for the GRAND PRIZE Blog Candy winner to say THANK YOU for visiting my site and offering encouragement. This cozy, shown above at right, was finally made for GiGi, winner of my last Blog Hop candy. GiGi agreed to patiently wait until after Christmas even though I'm sure her Bug has gotten mighty cold up there in Wisconsin! She asked for a white with light blue accents, embroidered with The Cricut Bug and this is what I came up with. What do you think? Comment once please on each card; each comment will get you an entry. You may comment on the Cozy Cover for another entry! If you are a follower or become a follower, please let me know in your post and you'll automatically get another entry. Drawings (for each of the candy, and the grand prize winner) will be at random, on Monday evening. GiGi and Tracy (another winner from a previous candy offering), your Cozy Covers went out in today's mail. Apologies for the delays in getting to the mailbox. If it's not one thing (new day job), it's another (new granddaughter), another (snow! ), another (Christmas!! ), etc. Look for them soon! Check back later this weekend, as I hope to add EVEN MORE candy and more cards along the hop. More chances to win, more prizes for the New Year, YAY! If you get lost along the way, the entire list of hop sites is posted at the start, Crafty Cards Gallery. Thank you for joining us this weekend -- and be sure to stop back for additional chances to win more prizes from the CardMonkey! Awesome, love your comp. generated sentiment!! Fabulous job!! Would love to win Candy#1, thanks! Love the card and the stem is so cool! I would love to win candy #1. I am already a follower. Happy New Year! I became a follower and would love to win candy #1. TFS! I am interested in the I-Top and love how you used it to create lovely brads. As always, I love your cards! Happy New Year sister! Love what you did with your computer--I definitely need to work on my skills!! I LOVE your elegant Thank you times 3 card. It is beautiful. new follower her and I loved both you cards....#2 sounds fun!!!! Both of your cards are beautiful! I became a new follower. I would like a chance to win Candy #2. Blog Candy #2 would be good. I've been a follower for awhile now. I really like your flower card, especially the stem. So cute! Oh! Love the simplicity of the 2nd card. Very pretty! Love the flower idea :) Happy New Year!! Ellen Card #2 is so Pretty! Thanks for a great opportunity to win, and being a part of a fun blog hop. Your cards are wonderful. I am a new follower would love candy#1. And.... I'd like to win Candy #1. I'm a new follower now! Thanks. What a sweet card creation! I just found your blog on this hop and am now a follower - so nice to meet you! I'd like to win Candy #1. What a sweet card creation! I just found your blog on this hop and am now a follower - so nice to meet you! I'd like to win Candy #2. What a great card for Candy #1! Love the simplicity of card #2! Always trying for blog candy. I love your cards, they're awesome! I'd love to win any of your candy, and am now following! Happy New Year!! love that you used a cake cartridge I had no idea you could! THanks for the tip! Also became a follower and I am also part of this hop. Love your candy too! And love candy #2 as well! Woohoo! Love both of your cards. Simple but elegant. Am a new follower, just found you with this blog hop. Would love the cchance to win both Candy #1 and Candy #2. Thanks for the opportunity. Happy New Year. I love the big flower and the sentiment as a stem, what a cute idea. I'm a follower and would like to win Candy #1. I love the simple and sweet card with the three thank yous. I'd like to win Candy #2 also. Boy am I greedy!! Thanks for a chance to win some great candy and have a Happy New Year!!! I absolutely love your card and blog. I am enjoying this my 2nd blog hop because I get to meet a lot of people that I would not have if it wasn't for the hops. So I am very happy to meet you. Your blog its great, I can't wait to come back and check it out when I get a little more time. Thank so much for participating and if you would like to check out my blog it is: http://deesdesignsfrommyheart.blogspot.com. Thank you and have a wonderful New Year. I love the card #1...I really like the technique you used to curl the flower...I will have to try that. oh my, you are a busy little monkey arent't you? Let's see if I can remember all of this. I became a follower because I love these thank you cards and I love the way you use so many techniques - the computer, Cricut, ink, etc. Card #1 is adorable and I would love to win Candy #1! My email is rdunham@q.com. Thanks so much! ok, if I win nothing else from this entire blog hop, I want that Cricut Cozy! I love it! I would like mine in purple and green when I win it okay? Not particular, just some combination of those 2 oclors :) Thanks so much for sharing all of your great ideas! I love your thank you flower card - nice. TFS! Also, I'm now a follower of your blog. 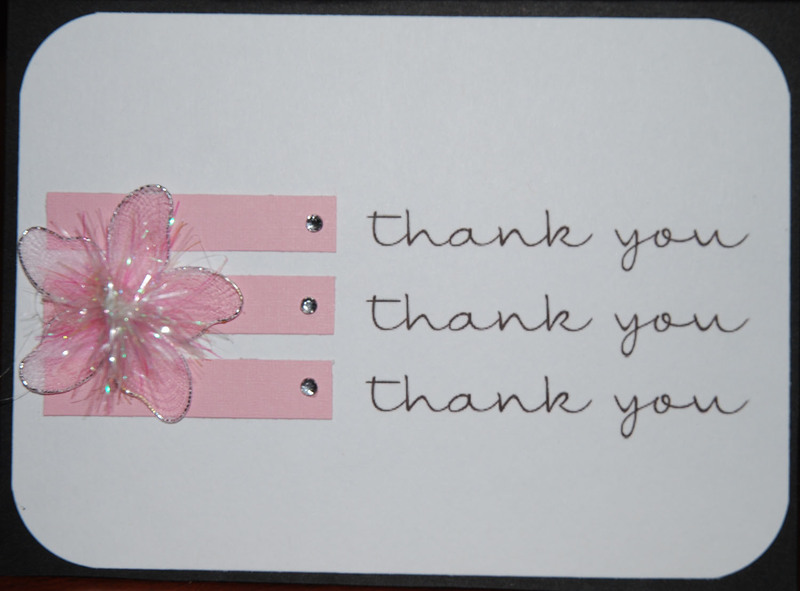 I also love your thank you card in pink - simple, pretty and elegant. TFS! Yuor cards are cute, I canoot decide which one I like the most. I'm a new follower and I would like to enter to Candy#1. Thank you!!! your cards are absolutely adorable! I would like to enter Candy #1 thank you!! I love your card (one # 1 right now) Love how it looks like the flower is peeling away from the card! I love both #1 and #2, you make such beautiful cards. I am already a follower and would love to win both #1 and #2. Awesome Thank You cards. Thanks for the blog hop! The card with the big flower is awesome! Thank you for sharing! Cut card #1 is. Would love a chance to win blog candy #1 and I'm a new follower. Thanks for sharing. Card #2 is very elegant. Thanks for sharing. Would love a chance to win blog candy #2. I'm a new follower also. Love card #3. Thanks for a another chance to win. Would love a chance to win blog candy #3. I'm a new follower. Would love a chance to win Custom Cricut Cozy! New follower and enjoying checking out your blog. I love your blog and your cards. Thank you for the chance of winning blog candy. Can't see the other cards that you come up with this weekend. I became a new follower. wow your card just kept getting greater. Card #3 is Wow. I hope I do this right. I love the card #1. Great job on how you did the flower and stem. I would also love to win candy #1. I have been a follower. You are so right...Card #2 is simple but elegant. I'd love to win candy #2 also. Card #3 is darling. Love the flowers. Candy #3 is super nice also. Love card #3. I'd like to win the flowers from #3. Thanks for the chance. Such a great card!!! Simple and elegant! The flowers are amazing. Wow! So many cards and that cover is precious. I really never thought about using one since I am on mine all the time, but it very nice looking. Love card number #3 Probably my most favorite so far. I am a follower and blog candy # 3 is wonderful. Love card #2 and the candy that goes with it. Love the cards and yeas a am a old time follower! Happy New Years. Already a follower. Love your cards so much. Such great inspiration. great cards. i would luv to win blog candy number 2.
card#1-I need to use my computer more often for sentiments. Thank you for your candy. Cricut Cozy- Wow this is the first time I've seen the cozy. I'm sure you will sell alot of those. Thank you for a chance to win one. who can not use homemeade flowers. I sure can. Lovely card. and am inspired to use my computer. Love your work, Thank you for the giveaways. I love the simplicity of card #2, it looks wonderful!! OOOh so pretty, I love everything about card #3, the shimmer paper, the sentiment font, and the gorgeous flowers, you do amazing work!! Card #3 is so elegant looking. Wonderful job! Thanks for the chance at candy 3!! Love the cozy cover you made too! Awesome job! Even after looking at all the thank you cards you have made so far...lol...I think I still like #1 the best! I would love blog candy 1,2,3,or 4!~ ;) And would LOVE the cricut cozi! (Would love something with hot pink and turquoise or aqua or black!) I am not very picky! LOL...I am a new follower as well! All three of these cards are gorgeous! I love the uniqueness of the first one! I am a follower! I would love to have a cricut cozy also!! Love the last card the best, but they're all great!!! And the cricut cozy is great!!! I can't believe all the cards you did! I think my favorite is the flower one. I have the Cricut Cake. I usually cut the fondant with the cricut cake and then put the cartridge in my expression and make a card to make the cake! OMG so many cards wow, I love them. Holy Cow..so many great cards...there isn't even a way to pick a favorite. TFS! You are so so talented, I love the way that you did the stem on the flower card! So glad I have been a follower for a while your cards provide such great inspiration! Candy #1 comment! You are so creative!!! :) I mostly buy sentiment stamps now that I love using my Expression, but you reminded me that I don't have to. I love the way you printed thank you around the center of the flower and the way you made a stem with the other sentiment! So clever-and it looks great! I like the paper piercing you did with your sewing machine, too! I am a new follower! Thank you so much for sharing your time and talent with us!!! :) I love that you post so often! And I want to win even more after seeing that great Cricut Cozy you made!!!!!!!!!!!! It is so cute! And I would love to keep the dust away! I have new colors in my craft room (or I should say, I finally have a craft room), so it would be so much fun to have my Expression match! Ohmygoodness, Ellen! Card #3 is so elegant!!! You've motivated me to try printing more of my sentiments! Not only is the font beautiful, but I love how large it is-perfect for this card! Your flower is wonderful. So talented. I love your Cricut cozy, it is so cute! Wow great blog I am a new follower! I love the name of your blog and my favorite card is Day 1 card #2. Beautiful job. I look forward to more inspiration! Card # 1 Would love to win the candy for #1! Such a cute & sweet simple card- love it! Card #3, I would love to win candy #3! Very elegant, great colors and beautiful flowers! Card #1 - I love how you used the sentiment for the stem of the flower. Card #2 is so simple and pretty. Card #3 is so elegant looking. The rose is beautiful. OH ELLEN!!! My new cover is SOOOO CUTE!!! I absolutely LOVE it! Thank you so much! Fabulous projects!! Love the cozy! Your all the layouts were able to apperciate ,i like your all the stuff,Especially your big size flower card were so impressed me!!! !